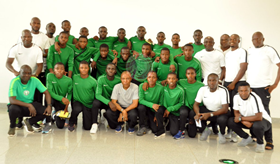 Golden Eaglets coach Manu Garba attended the mandatory post-match press conference shortly after the five-time world champions beat hosts Tanzania 5-4 in the opening match of the 2019 U17 Africa Cup of Nations. The 2013 U17 World Cup-winning manager admitted that his team could have been at least eight goals up in the first half if they had converted their chances. Coach 3-1 up, 4-3 down, your boys managed to come back and win the game? First of all, I must have to congratulate our opponents for giving us a good fight. Having said that, we were 3-1 up in the first half but it could have been 8,9. I was very furious with the boys when they came to the dressing room. There were some unpardonable misses in the first half but even then we told them that we are just starting the match, let them go to the second half as if they have not scored but unfortunately, like what my colleague said, youth at times you tell them this and they'll go and do another thing. I must congratulate them for still coming back and winning the game. The most important thing is to get three points which we have gotten so I give Almighty Allah the glory for the three points. Did you think that the two penalties were penalties and if so what are you going to say to your players about their defending? I think win or lose, I don't want to complain about the officiating. This is for the officials, everybody has seen what has happened. As for me the referee has taken his decision, nobody can question the referee's decision. The referee's decision is always final. Thank you. Coming from behind to pick up a 5-4 win against Tanzania, will you like it this way or you prefer it the other way around? Let me just say one thing, Nigerian team that played today, half of the team this is the first time they are entering an aeroplane. Half of the boys are inexperienced but the team can always get better. I believe we'll take matches one by one. The team can always get better. God willing we are going to win the next game.